OMG the nicest property I ever stayed on. It was absolutely better than the listing it was clean nice furniture soft comfortable beds very clean bathrooms plenty of storage space plenty of room for my grandchildren to run around. The pool area was beautiful the hot tub was amazing. The guest check in was smooth and easy. I could go on and on for days about how perfect this place was. we were welcomed we felt like we were at home. The distance to Disney World was only minutes away. Very home away from home ish. There was plenty to do in and around the area as far as shopping outlet malls excetera. We only had one issue with the door lock and the property owner took care of it right away. We were very very satisfied with this property loved it my daughter even wanted to purchase one. We will tell everyone we know about this property. Worth every cent and it was cheap. 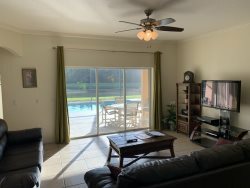 Wonderful place to stay Reviewed by: Aurea I from Reviewed on: 09/01/2015 for their stay in 08/2015 Sunset Retreat on the Lake We had a great time at this vacation home. Everything was nice and very clean. We had everything we needed. The host Stewart was very nice and accommodating. I would definitely return to this very nice place. thank you Stewart.